Sharing What You Do Online – FTW! A little under two years ago I had been teaching for six years but had not considered keeping a blog and I wasn’t on Twitter. Both of these outlets have had a significant impact on my teaching and the learning that takes place in my classroom. This morning I was reminded of just how valuable sharing what you do online is. Catching up with tweets during New Years Day, I decided, very much on a whim, to have a go at a #365 project. A 365 project is where you take a photo a day for 365 days. I already had a Posterous blog set up that I had been using for posting photos and thoughts that didn’t really fit on this blog. Therefore, I had to do little more than start adding the photos. Having had a significantly hectic day yesterday, I got home, ate dinner and then, while working on my MA realised that I had not posted a photo for the day. In fact, I had not taken any photos at all during the day and there was nothing on my phone or laptop that I felt like posting. Instead, I decided that I would simply post a screen grab of what I was working on at that moment. 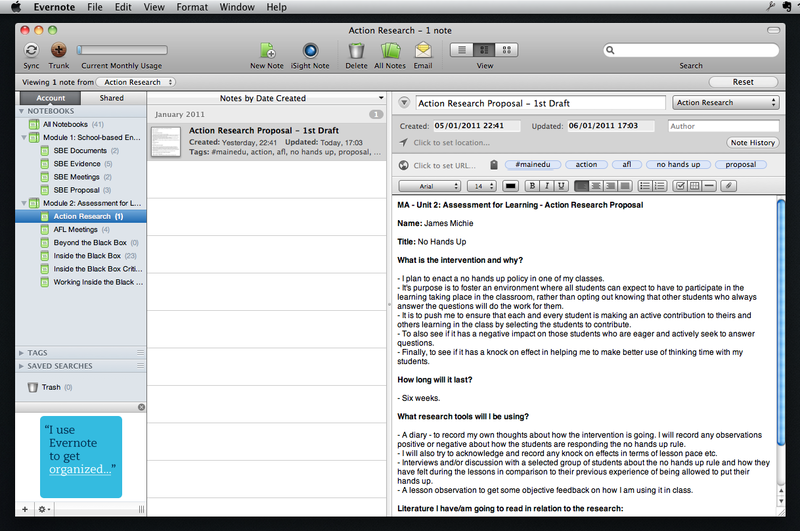 As you can see I am using Evernote to organise my MA. I have folders set up for each module and within those folders I have note books where I have recorded meetings, research proposals, notes on readings etc. I shared this on a whim, more out of ensuring that I kept up with the #365 project than anything else. I didn’t expect anyone to really look closely at the image. But in this I was wrong. If you zoom in on the image you will see that I was working on my ‘Action Research Proposal’ for my ‘Assessment for Learning‘ module. I have decided to put a ‘No Hands Up’ policy in place with two of my classes. This morning, checking my email, I saw that I had a comment from Christine Roberts (@Christiner733). She shared with me how she deals with the idea of ‘no hands up’ in her classroom and also shared her feelings on how her students respond. What had been for me more a formality of keeping up with my #365 project; an innocuous post which had no intended outcomes, led to the sharing of good practice and ideas. Once again proving that sharing online is valuable. For those of you who are not into your acronyms – FTW stands for ‘For The Win’ and I believe this to be true of sharing what you do online. Take the time to reflect on the teaching and learning that takes place in your classroom. There is no better way to do this than to write about it – IMO! Blogging is so simple, particularly with platforms such as Tumblr and Posterous that require almost no set up or web expertise to get started. And join Twitter, there are a plethora of talented and genuinely nice people out there who are willing to share ideas and help you grow as an educator. Posted on Friday, 7 January 2011 Sunday, 4 May 2014 Categories Blogging, Education, MATags #365, #mainedu, afl, blogging, education, evernote, ftw, learning, ma, pd, posterous, sharing, teaching, tumblr, twitter2 Comments on Sharing What You Do Online – FTW! What is your preferred blogging platform to use with students? [Edit] Results of the poll were interesting. Posterous came out on top with 37% of the vote confirming its status as blogging platform of the moment. It was followed by WordPress, Blogger and Tumblr. However, no one platform gained a majority of votes reflecting the diversity of blogging experiences across my PLN. You can contact me by Email or Twitter.